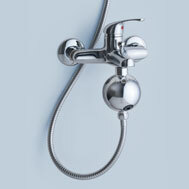 The Equator Shower Filter reduces the dry out of skin and hair. Do you also experience dry skin, itching or dull hair? One of the following could be the reason for it: Chloride in the water may dry out your skin and hair. Additionally, harmful trihalomethan (THM) is built and might inhaled. Heavy metals in the water are absorbed through the skin and are being embedded in the body. Heavy metals are the cause of many chronic diseases. Hard water stresses your skin and hair in particular and may lead to a higher usage of shampoos and shower gels. Especially for persons with sensitive skin (e.g. neurodermatitis). The water feels significant softer on the skin.